There’s so much I want to tell you. We’ve been in Berlin long enough that our lives are becoming less simple. Events are ricocheting off each other, and I can hardly find the thread in the story. When we first arrived it was easy – a new thought would seize me, and the blogpost would come pouring out. Now the input is coming so fast that I can hardly make sense of it all. We’re seeing new parts of the city; we’re having friends over for dinner. We’ve gone trick-or-treating and have toured Potsdam and the Sanssouci castle and discovered an incredible Mexican restaurant in Kreuzberg. We’re breaking up small squabbles among our kids and enjoying the moments when they’re best pals to one another. We’ve read the list of concentration camps posted outside Wittenberg Platz, where we go to the drugstore. I’ve learned what Stolperstein are. We’re planning for visits from friends and family over Thanksgiving and Christmas and thinking about recipes. I’m starting new work contracts, I’ve finished reading Zeitoun, and life here is turning out to be quite like life anywhere – complex. I have started five different blogposts in recent days but none of them seem to go anywhere – at best they are just an attempt to capture what’s happening day to day. I can’t make sense of it all yet. I feel responsible to you, my friends, because you’ve been remarkably kind to me over the past few months. You’ve followed this blog, or commented on an entry. Some of you have liked a post, told me you look forward to reading the next post and are disappointed if nothing is there, or you simply read along from time to time and occasionally drop me a line to let me know, and all of this makes me exceedingly grateful that someone invented such a thing as a blog, that someone suggested I start one, that something inside me decided to go for it, even though I had no idea where it would lead, and really still don’t. But it’s well worth it. Thank you. All of you. So, in the interest of continuing this story and staying in touch, here is the handful of remnants I can offer. It’s all I can piece together right now. Maybe if I clear the deck of some of this detritus gathering in my brain and notebooks, I can get back to writing the handful of stories I would like to share. First of all, the boiler back home is fixed. By the time I wrote to Grandpa Boilerman to see when we could get onto his schedule, I heard from the tenants in our house that it had already been installed. It felt a little funny getting cut out of the information chain, but maybe that’s how it is when you’re an absentee landlord. You make arrangements and things happen without you. Grandpa contacted the renters and found a mutually agreeable time, and next thing you know, he installed it. The bill should arrive any day now, he said. That was a few weeks ago. We trust that our house is warm and our tenants are comfortable. Right now we’re of the mind that no news is good news. Meanwhile we’ve managed to clog the bathroom sink and shower drains in our flat here in Berlin. Perhaps my thick hair and that of my offspring is the culprit. Even if it is, I don’t know what to do about it. The sink fills up with water when you brush your teeth. And a shower with the lightest water pressure still leads to a backup of suds in the stall. We’ve tried to clean it out but nothing seems to work. I’ve sent our landlord an email asking what he’d like to do. I’m feeling like a bad tenant, like having hair is something we should have disclosed on our renter’s application. As for Halloween, it does happen here. It’s most definitely a US import, and a recent one at that, but it does take place. We had the chance to experience it last Thursday. Trick or treating happens in shops and restaurants more than at residences. We went with a family we know in Kreuzberg, and they took us to Bergmann Strasse where there’s a market hall and the street is lined with cafés, wine bars, noodle shops, bookstores, cobblers, drycleaners, gift stores, grocery stores… you name it. “Sweets or sours!” is what the kids say here, although they say it in German, of course: “Süßes oder Saures!” A few of them seem to carry eggs with them, and they pelt them at doorways where no sweets were forthcoming. We didn’t witness the egg-throwing but we did have to step around a number of cracked eggs in doorways and on the sidewalks. A little girl in our small group carried a tube of toothpaste to show to shopkeepers who weren’t handing out sweets – to say she’d leave a trail of toothpaste on their entryway if they didn’t cough up some candy. But she didn’t actually wield it at anyone, nor did she dispense any toothpaste. I don’t like this side of Halloween, but then again I’m sad when I see jack o’lanterns smashed in the street back home. It’s just the other side of the holiday that I like to forget about. The “trick” part. The sour. The treats were a little different from the various shops we visited. We went into the Marheineke Market and stopped at most of the stalls. The butcher handed out a rolled up piece of bologna to each child. The Bio Backerei handed out fresh-baked cookies; a young woman used tongs to place a few treats into a small wax bag as each child stepped up to the glass case. The shoemaker, wearing a tan leather apron, handed each child a cardboard Advent calendar wrapped in cellophane. The grocery store clerk handed out clementines and balloons. The kids entered the front doors of wine bars and walked past tables of grownups sipping their wine by candlelight. They strode into bars where Chet Baker’s voice spilled into the street. They wandered into Asian noodle shops where twenty-somethings devoured steaming piles of noodles and vegetables. Most of the shops handed out one small hard candy per child. By the end of the hour of sweet-or-souring, their sacks were full of candy but most of it was not really of interest. The best Halloween candy had come in a package airmailed by good friends back in Grand Forks, North Dakota. Germans are quite proud of their fine-quality chocolates here and like to disparage American candy, but no one was handing out Milka or Ritter Sport or any of our favorite brands of undeniably delicious local chocolates on this particular occasion. In the neighborhood where we went trick-or-treating, I noticed several Stolperstein in the path. Stumbling blocks, they’re called. 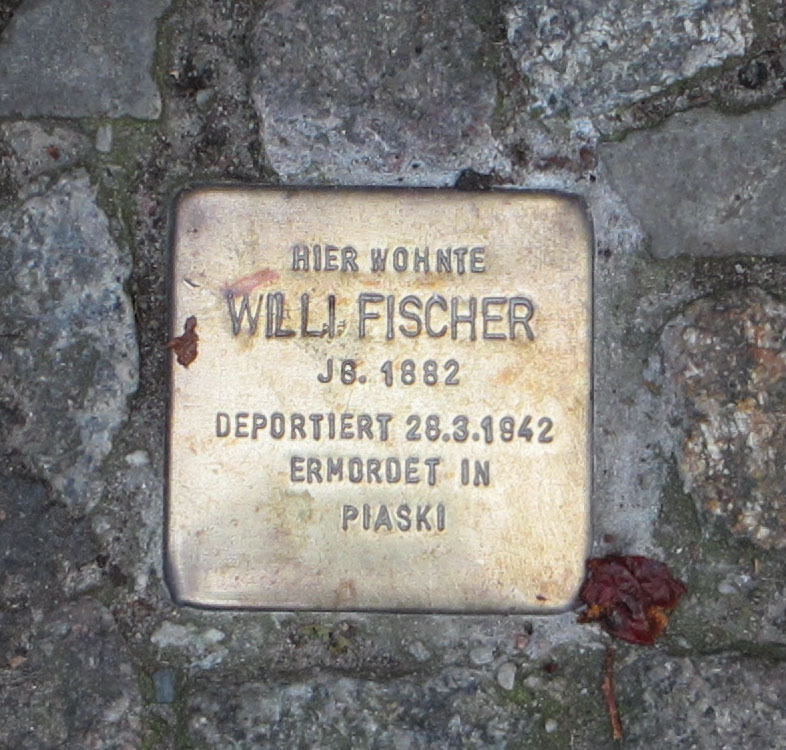 They are small plaques embedded into the sidewalk in front of residences where victims of the Holocaust once lived. They jar me every time, as they are supposed to. They make you stumble, mentally, as they inform you that in this very building you pass as you trick-or-treat, lived a man who was going about his life, who was removed through this front door you see before you and taken to a concentration camp, and did not survive the war. Who can make sense of such things? Yesterday I finished Dave Eggers’ book, Zeitoun. It follows the events in the lives of a family in New Orleans during and in the aftermath of Hurricane Katrina. The husband stays behind to look after his property and the buildings he owns and manages throughout the city; his beloved wife and their four children leave the city. We hear about the extraordinary things this Syrian native and other New Orleans residents do to restore humanity to the people they encounter in a small canoe when the world falls apart around them. And how their feats of bravery and selflessness are repaid by the US government… with arrest and placement in a maximum security prison on suspicion of looting and terrorism. They are made to endure brutal treatment at the hands of US government officials who are spending more time locking people up than saving residents from the flooded, broken city. It’s a dark and shameful story. The first half of the book builds your trust in this big-hearted man; the second half breaks your heart at how he is treated. How my country treated him and others like him. This happened in 2005, yet reading the book brings it all back like it was yesterday, and reveals one man’s journey that is life-changing for him and potentially for the reader. The agony of this story is that it was not just one man who was treated this way; he stands for so many like him who are left behind by our society. I think about my ardent love for my home—my block, my neighborhood, my city, my country. I must be a proud American to write the things I do. Yet reading a book like Zeitoun reminds me of all the ways my country disappoints me, fails me, shames me. Shames us all. I think also of the handful of friends I have back home who say they would never come to Berlin for a long stay; some say they never want to set foot in Germany. That the horrors of the past are too real. But they have not met our German friends who are as real and empathetic and thoughtful as they themselves are. There is so much good here, all around us. The shame of how Zeitoun was treated looms large in my mind. I have to get over the shame of being an American as much as Germans have to get over the shame of being German. We all have shame. We all have to get up and live our lives in the face of the awful things we know have happened, done by others who look and sound like us. It’s all we can do. Our landlord just stopped by. He showed us how to release the drain on the shower to remove the accumulation of, indeed, hair. He plunged the sink. The water is flowing freely again now. Maybe by unclogging our pipes and sharing these stumbling blocks with you, I will sweep the clutter from my mind and the stories will come again. This entry was posted in City life, History and culture and tagged Berlin, Dave Eggers, Halloween, Hurricane Katrina, New Orleans, Stolperstein, trick-or-treating, Wittenberg Platz on November 4, 2013 by Jill M..
Oh Jill – even when you claim to come to us with only broken pieces in your hands, how swiftly you shape them into something beautiful and true and, yes, unified. Your superpower, my friend, is a glorious thing. And pour boiling water down your drains once in a while to loosen up all that hair. 🙂 Advice from a plumber whose first advice was that I shave my head. Merie, you are too kind. And yes, it has occurred to me that all the women in this house are overdue for haircuts, but like you, we’re not ready for the bald look just to spare the drains.